We are working constantly to present before our clients the best range of fasteners that are machined to perfection. The finest quality of our product range is due to the innovative technology that we use in the manufacturing process. 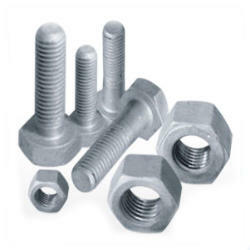 Our product range comprises of Industrial Nuts & Bolts, Carriage Bolts, Half Thread Bolts, Nuts, U-Bolts, Bolts, Industrial Fasteners, Hex Bolts, Special Bolts, Hex Nuts, Metal Washers, Studs & Threaded Bars etc. Being the eminent manufacturer and supplier, we are backed by a wide distribution network.The sincere efforts & fortitude of our talented and highly qualified team has helped us in gaining an enviable position in the national and international markets.The entire product range of ours conforms to the various International standards that have assisted us to raise the bar of excellence and quality in our products.